HARD BARGAIN, Karen Blomain's first full-length collection in seven years, celebrates the quotidian as it exalts the focus of memory, the thoughtful contemplation of family, loss, friendship, the writerly life, the bittersweet of leavings, the grand forces and the small common gestures that bind us together and call us to language. the abysmal lurch between F and D.
when a patient nears death. How? it's time to leave off judging for a while? just as it is, the world is already all right. and there should be no splash. 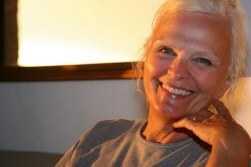 Poet, playwright, novelist, editor, and visual artist, Karen Blomain, lives in Scranton Pennsylvania and Puerto Vallarta, Mexico. She conducts writing workshops across the US and in France, Ireland, Russia and Mexico. Hard Bargain is her third full-length collection. 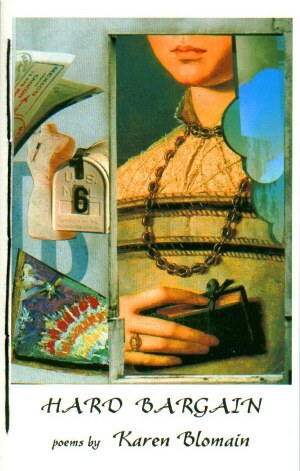 In addition, she has three chapbooks of poetry and extensive periodical publication. Her novel, A Trick of Light, was optioned by Barbra Streisand's Barwood Films. The play, An American Wife, which she co-authored with her husband, writer and photographer, Michael Downend had its Equity premier in 2007.